As the world turns to realising the new development agenda with the adoption of the Sustainable Development Goals, we are concerned that spiralling wildlife and forest crime, fuelled by corrosive corruption, can impede vital progress. Almost five years have passed since the International Forum for Tiger Conservation was held in St. Petersburg in Russia, which also launched the International Consortium on Combating Wildlife Crime (ICCWC). The event built momentum for the growing recognition that the Tiger faces a desperate struggle for survival in all its habitats. But, the Forum went much further; the focus on the Tiger was rightly viewed as emblematic of the battle being fought for our planet’s biodiversity everywhere. Since St. Petersburg, other conferences have continued to move these issues forward, including the CITES’ Conference of the Parties in Bangkok, the Elysée Summit, the London Conference, and the Kasane Conference. 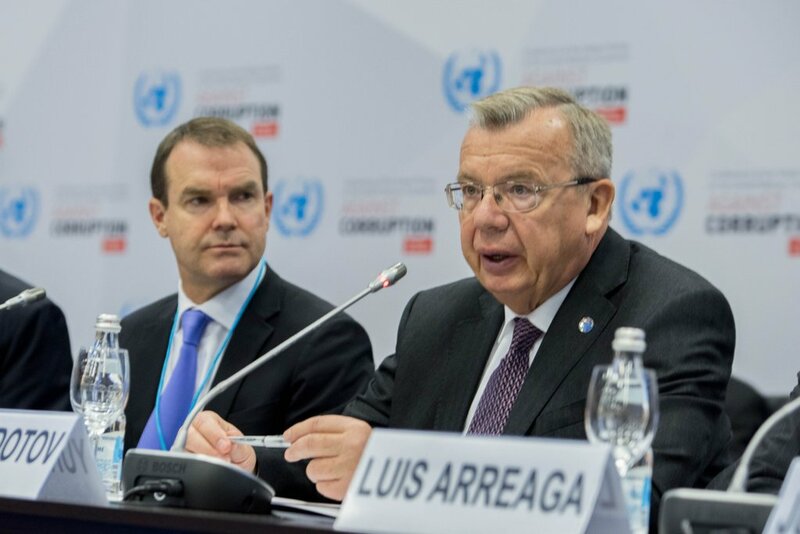 It is appropriate, for these reasons, that the Sixth Session of the Conference of States Parties to the UN Convention against Corruption should be held in St. Petersburg marking the International Forum’s 5th anniversary. We say this because corruption feeds and sustains wildlife and forest crime, as well as many other crimes including terrorism and extremism. For the criminals to succeed, customs officials must be bribed to look away; logging and hunting licenses forged; and poachers set free due to obstructed prosecutions. Thanks to corruption’s deadly touch, the natural wealth of countries is being stolen, efforts to eradicate poverty paralysed and development efforts greatly hindered. We are united in the belief that, by addressing corruption and bribery, we can deal a significant blow to all those involved in this transnational organized crime. Central to this work is the ratification and implementation of the UN Convention against Corruption. With 177 States parties we are close to universal ratification, but more needs to be done to encourage every country’s complete implementation of the Convention, which has been recognized by the UN General Assembly and CITES Parties. Full implementation means fully using the Convention’s tools to prevent corruption, the prosecution and punishment of offenders, and a global alliance founded on cooperation that embraces international organizations, including within the UN family, international organizations and civil society. Wildlife and forest crimes are serious crimes and they must be treated as such by nations willing and committed to shattering the international criminal networks that supply this disastrous illegal trade. But, in doing so, we must make best use of the UN Convention against Corruption, and the agreed suite of tools it provides, in eliminating the corruption that helps make these highly destructive crimes possible.